A strong trough over UK rapidly translates towards France. A weak upper low over southern Mediterranean finally dies while moving east. 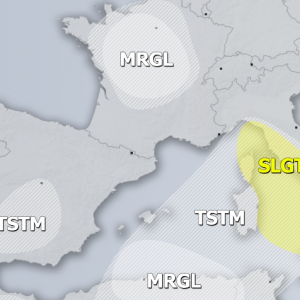 A SLGT+ risk has been issued for S Greece and Crete with threat for severe winds, heavy excessive rain and some tornado / hail threat. Area will be monitored for possible upgrade into MDT risk on DAY 1 if conditions will be more robust on models tomorrow. A SLGT+ risk has been issued for N UK and areas towards Iceland for severe winds with the trough / cyclone crossing the region. 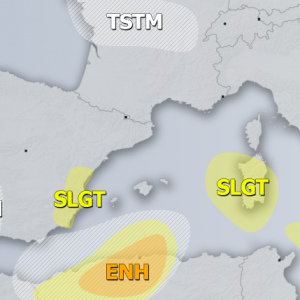 A SLGT risk has been issued for NW Mediterranean with threat for severe non-convective wind gusts. 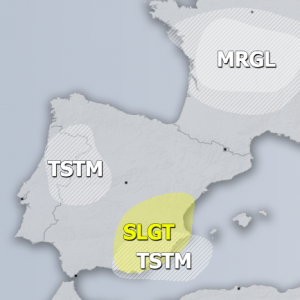 A SLGT risk has been issued for coastal N Algeria with threat for excessive rain and some strong to severe winds.